Summer is meant for fun and fresh flavor combinations. Lemon and raspberry are the perfect pair. Here I take tart raspberry taste a step further by with a childhood blue raspberry flavor and a mermaid colored theme. The Blue Raspberry Mermaid Cake delivers in taste. Additionally this cake also delivers in creamy, moist, and tender texture! Blue raspberry evokes memories of bank lollipops and afternoon snow cones. There is no naturally occurring blue raspberry flavor. Searching yielded no ‘fresh’ recipe. Many baking concoctions used flavored drink or gelatin packets. Here I opted to create the same flavors with a homemade, not pre-made, twist. Only a small hit of raspberry extract is needed. Lemon zest and lemon extract accentuates the bright and sharp acidity of raspberries. A bit of vanilla rounds out the flavor, without taking the lead. This cake is, what I call, a half-and-half cake. A combination of cake flour and all-purpose flour creates a tender and sturdy crumb; while a mix of butter and oil provides structure and moisture. For this cake, I am taking about a non-premade approach to Blue Raspberry. 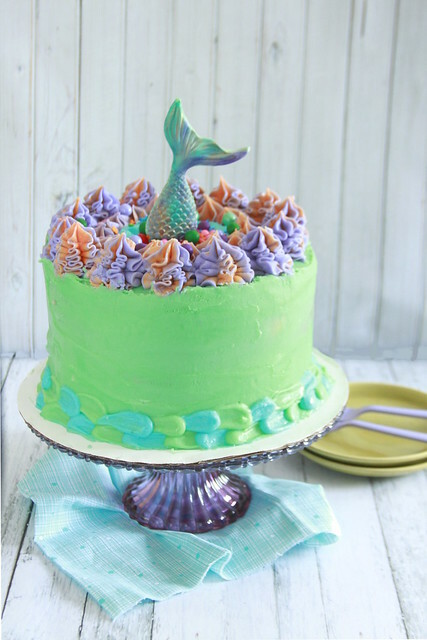 However then I cover up the Blue Raspberry Mermaid Cake’s freshness with vibrant rainbow coloring! I feel like mermaid and unicorn color themes are one-in-the-same. If you wanted, you could stick a unicorn horn on top of this cake and you’d have a completely (cough) different theme. The sea foam, nautical green color of this lemon buttercream ties this cake back to the ocean. 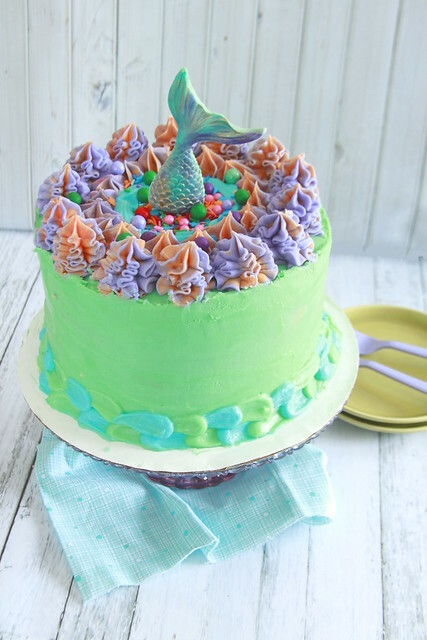 So enjoy the Blue Raspberry Mermaid Cake for it’s vivid colors and fresh flavors! Sift flours, baking powder, and salt in a large bowl. Beat butter and lemon zest in a stand mixer fitted with a paddle attachment, about 45 seconds. Scrape bowl, add sugar, beat until light and fluffy, about 2 minutes. Lower speed to medium-low adding eggs, one at a time, beating well after each addition. Scrape bowl and paddle. In a spouted measuring cup whisk together, buttermilk, lemon juice, and extracts. With mixer's speed on low, add dry mixture in three additions alternately with wet mixture in two additions, beginning and ending with the dry mixture. Give batter a final mix by hand to ensure nothing is stuck to the bowl or paddle. Divide batter into 4 portions, tint one portion orange, one pink, one purple, and one blue. Spread all of the orange into first pan top orange with ½ of pink. Portion out pink into second pan, topping with ½ of blue batter. Pour purple into bottom of third pan and top with remaining blue batter. Use a butter knife to marble batter. Pan pans against table to release any air bubbles. Bake for 25 to 30 minutes, rotating halfway. The cake should be slightly golden and toothpick inserted should come out mostly clean with a few moist, not wet, crumbs. Let cakes rest in pans for 5 minutes before inverting onto a wire rack to cool completely. In a stand mixer fitted with a paddle attachment, beat butter and cream cheese on medium-high speed until well blended, about 3 minutes. Gradually add powdered sugar on low speed. Scrape bowl and paddle as needed. Drizzle in lemon juice followed by extracts and salt. Raise speed to medium-high beat for final 30 seconds. Tint ¼ cup yellow, ½ cup pink, ½ cup purple, ½ cup blue and remaining frosting green. Refrigerate until assembly. Dollop a bit of frosting on a cake board. 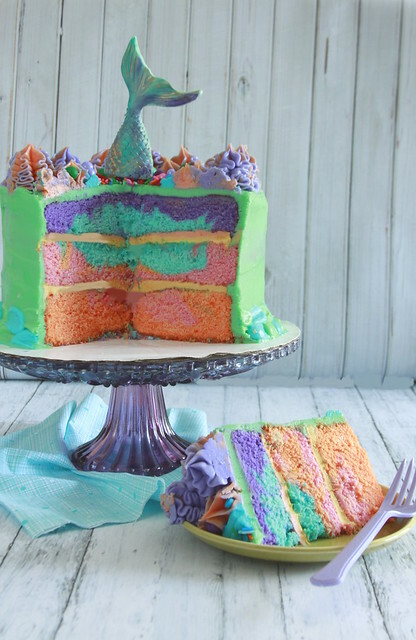 Secure orange-pink cake layer, spread yellow frosting onto layer, secure pink-blue cake layer, spread on even layer of pink frosting, top with blue-purple layer (purple side facing up). Base frost cake with green frosting. Refrigerate for 10 minutes. Frost cake with a final, thicker, coating of green frosting. Refrigerate for a final 10 minutes. 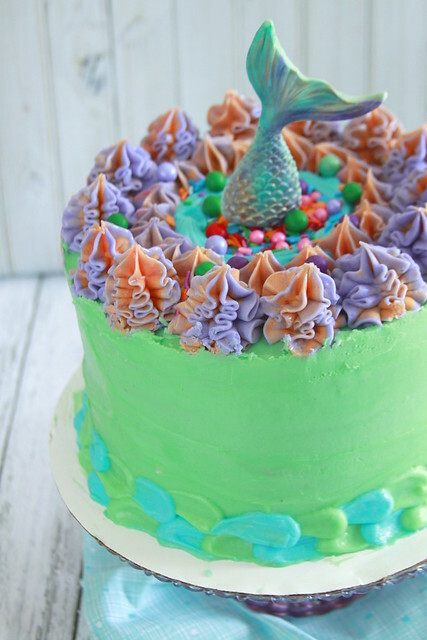 Pipe mermaid “scales” on boarder of cake with blue and green frostings. Garnish with pink-purple frosting and sprinkles.